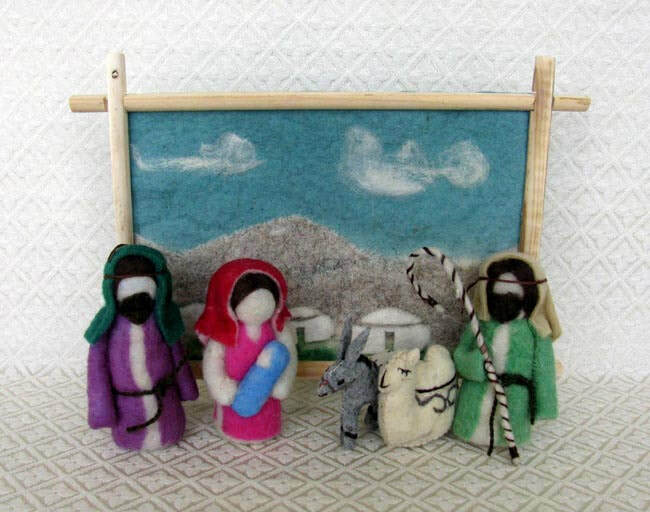 This Nativity is handcrafted from wool felt by Tanya in Karakol, Kyrgyzstan (near the China border). The figures include Joseph, Mary holding baby Jesus, a shepherd with staff, a donkey, and a camel. The set includes a wool backdrop mounted on a wood frame. The backdrop depicts the rugged Tian Shan mountains (appropriately meaning the Mountains of Heaven) and some yurts—the traditional felt dwelling of Central Asian nomadic peoples. The backdrop is supported by small metal pegs. The Joseph figure measures 4.25 inches tall. The backdrop measures 11 inches wide by 8.25 inches tall. Tanya is part of a women’s sewing group. Many of the women in this collective have been rescued from abuse, prostitution, or trafficking/bride kidnapping. Tanya is mostly self-taught in her skill of working with wool and felt, but she learned some techniques from her mother and grandmother as she was growing up. Tanya enjoys the cooperative of women with whom she works, which gives her opportunities to grow in her handcrafting skills, build friendships, and increase her economic stability. She also remains busy caring for her family, including elderly parents. $50. Please click here for purchasing instructions. Special order.